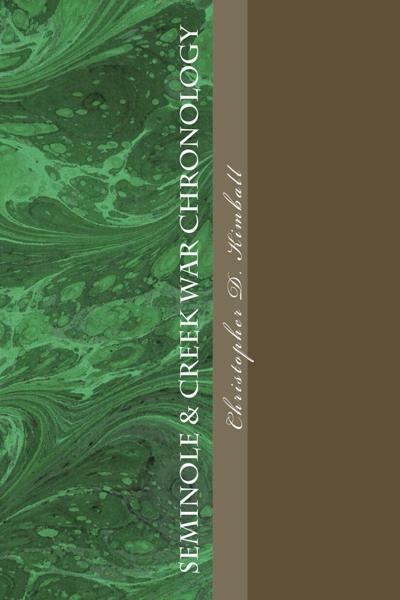 New Book: Seminole and Creek War Chronology! Anyone remember my Seminole War Timeline book from 12 years ago? I have re-published it! And it is an improved version which is now available on-line. You can order a hard copy from createspace, or a digital one on kindle. The Florida Seminole Wars were the longest, most costly and bloodiest conflict the United States Military ever fought against Native American people. What history calls three wars are considered among the Seminoles as one long conflict lasting decades. Never before has there been such an interesting and accurate chronology of the Florida Seminole Wars. Additionally, this academic quality book provides a regional perspective of the Seminole Wars importance by covering the first and second Creek Wars of the southeast. After 20 years of research, the author has documented many small skirmishes and events that were often overlooked in previous publications making this a must have for anyone interested in Florida or American history. I do not have the fort list that my old copy had—too many issues with it, and I had constant problems with the list. There are other books that include fort lists anyway. This chronology is unique and no one else has done a successful job at printing anything new like this. So I stuck to the timeline, but it is now improved. I researched several skirmishes over the past 12 years that I had problems with, to verify or correct. Several books on the Creek wars published in the past 5 years have really helped me out, and I have added the Creek War battles as well. I think that many of you will be astonished at the Creek War battles that covered 1836 in Georgia and Alabama--most of which the Creeks won! I am very excited to see this become available!